I'd like to go to Brecon Becons, possibly Pen-Y-Fan or other walks near Storey Arms, the first weekend of February. Do you know if it's ok at that time of the year? I'd be travelling from London but could wait until last minute to check the weather and book train and hotel. It’s fine at the moment if a little damp, if it’s an option for you to do as late as possible then I would. There is some snow forecast and the weather does change here quite quickly, but it doesn’t seem to stop the hundreds of people every weekend taking the tourist route up Pen y Fan so I wouldn’t worry. Thank you, I thought it might be pretty with the snow actually, but only if possible to walk then. If you plan on walking up at higher altitudes then check the forecast before you go. [/size]https://www.mountain-forecast.com/peaks/Pen-Y-Fan/forecasts/886It also very much depends on what clothes/footwear you intend wearing as to if it will be ok or not.Down at the Storey Arms it can be very different to walking around on the top of Pen Y Fan. If you plan a walk around and near to the Story Arms and stay at lower altitudes then still check the forecast but it it tends to be a little more benign than higher up of course.If you are lucky even in February it can be nice & dry, although cold but still a fine walk up to the top of Pen Y Fan, (assuming you go straight up from the Storey Arms along, whats sometimes called the motorway and descend along a different path which will take in about four miles). It is very manageable. Lots of people use that particular route so maybe not to everyones liking but it is still a great day out, if it is your first time..Much depends on what previous experience you have, & there are lots of people on here that have much more than me, & likely to give great advice. My wife & I took our (then) 8 year old daughter years ago, up Pen Y Fan when it was around 5C as we got out of the car but 3/4 the way up the ground was freezing and the wind made it bitterly cold. My daughter had a few tears at one stage, and I told her we could go back down. But after some hot chocolate, and by coincidence meeting a guy coming down who walks up & down regularly just for excercise, who gave my daughter a chocolate bar. He told her a story about how his Dad took him up for the first time when he was 6 years old.She really perked up and we made it to the top. I stayed very much conscious of what was happening weatherwise though. But it turned out sunny and bright so, the forecast that day was correct. Take a look at this website for a decent weather forecast. 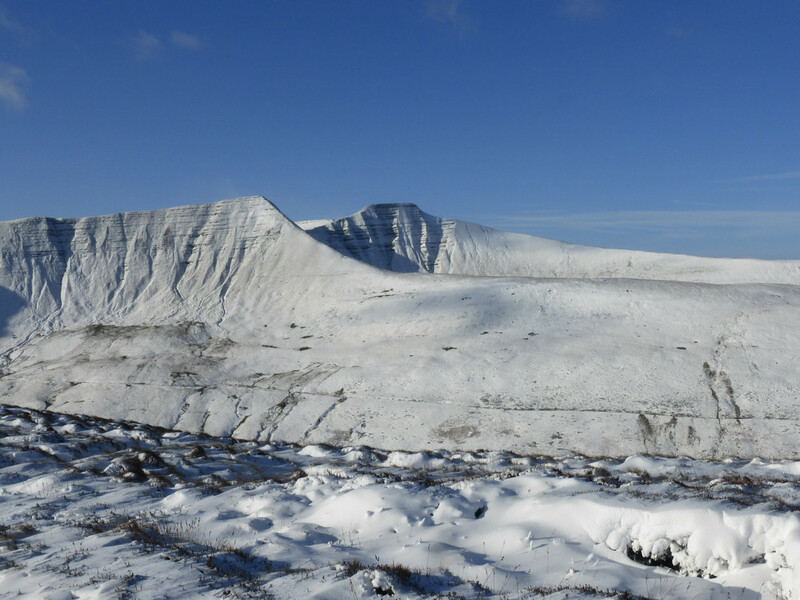 The met office also forcast for several summits in the Brecons. I was actually thinking of heading there next weekend myself, as it looks likely there will be plenty of snow on the tops. If I do I will post it here. If you are coming in from the South, then the car park below lower neuadd resovoir, Grid SO 036170, is a great start point to walk the Pen y fan horseshoe route. Be sure to rap up warm. I recall the last time I walked there, this time of year, the wind chill was -14 C.
Here’s an offer for you Vincent, I live close by and have done my whole life, if you want some company let me know and I will walk it with you, I’ve walked it dozens of times, no problem if not but the offer is there. Thank you everyone for the responses. Yes I guess if it's too difficult to go to the top, I could walk somewhere else around Storey Arms. I'll still check the weather a few days in advance and decide then. Thank you for the offer Phil, I'll check with my friend an let you know. Hello, sorry, I have another question. Do you know where's a good place to stay (for someone going with no car)? I've been told Merthyr Tydfil might not be the nicest place to stay. There's also Brecon but longer to get too. Or maybe just Cardiff for the first night and then bus from there? Currently my friend, who is in his final two months training at Sandhurst, before joining his new regiment, is sleeping out somewhere in the Beacons. He has been there since Friday, and the sleep out, is for five continuous days. If conditions are anything like it was in the Carneddau last week, then i do not envy him one little bit, very deep snow, knee deep at low levels, and hard going. Years ago, i can remember my balaclava freezing solid, on the Gap ridge towards Cribyn, whiteout conditions, and boy was it cold, windy as well. 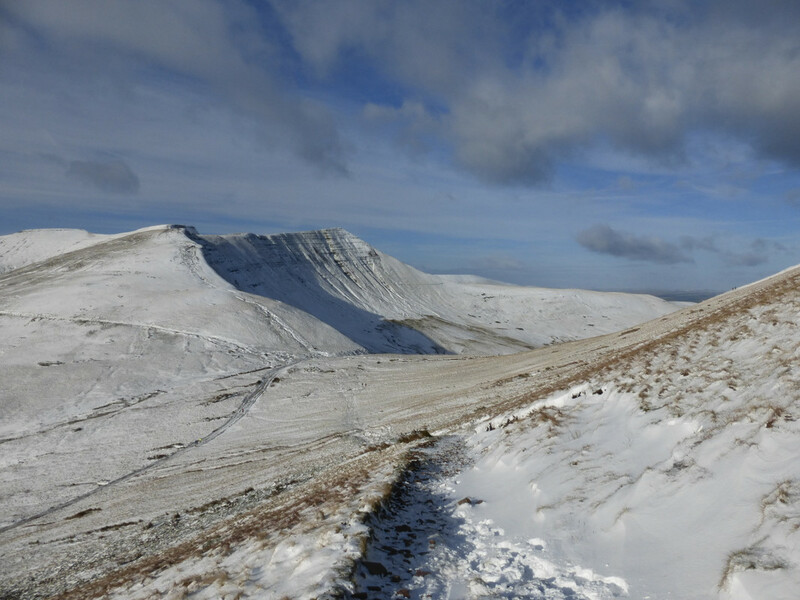 Checking out the weather forecast is vital for a winter jaunt in the Beacons, and having the right equipment is also essential, as the main ridges radiating towards Pen Y fan attracts some of the most hostile weather anywhere in Wales. It was on the path leading to the summit of Pen Y fan from Corn Ddu, that i had to crawl on all fours, such was the strength of the wind. Ive never encountered wind like it, anywhere in Snowdonia, i was a lot younger and daft as a brush, so relished the excitement. Best advice, go well equipped, check the National Park weather forecast, and if the weather looks changeable, head back to the car. I took a photo, a few years back, of my son leaning into the wind, from the top of the ridge. It looks like he is about to take off. This shows the gap road (not ridge) that DA refers to in the centre of the pic with Cribyn on the left. This was taken descending Fan y Big down Craig Cwmoergwm.